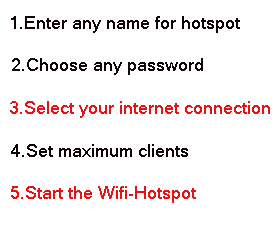 Home » Download , windows , windows 7 , windows 8 » Simply Share Your Laptop Internet Via WiFi ! Simply Share Your Laptop Internet Via WiFi ! i am back with a cool software. do you know you can share your laptop/pc internet via your wifi ? you can convert your laptop into a hotspot. this software can limit connections and it helps us to stop other wifi users to get internet access of your laptop/pc .